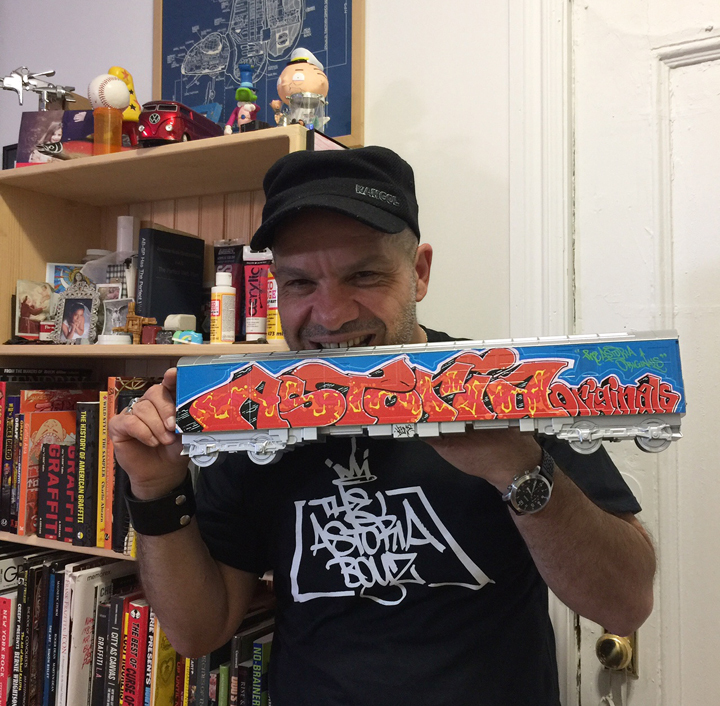 Born in East Harlem and raised in Astoria, Queens, Louie “KR.One” Gasparro has been sharing his vast creative talents — both as an artist and as musician — with us for decades. 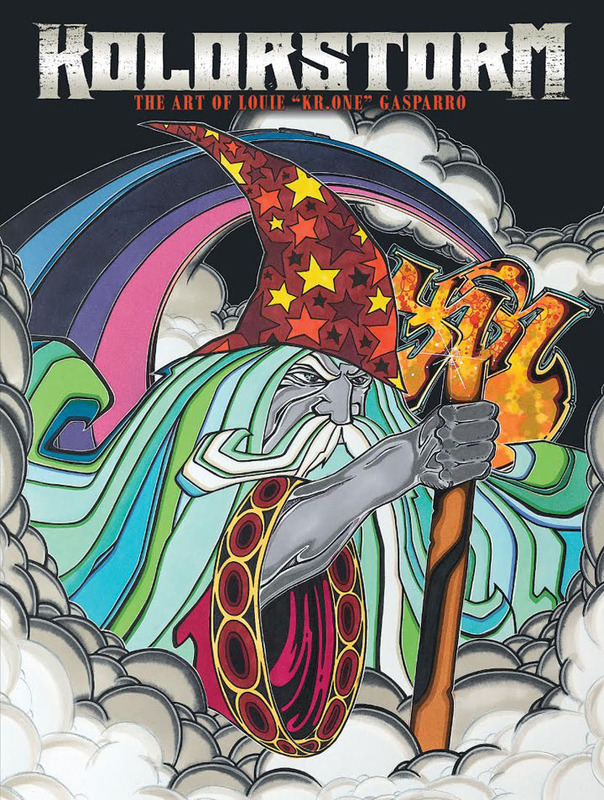 “Louie was an original,” Sacha Jenkins writes in the introduction to the recently-released KOLORSTORM: The Art of Louie “KR.One” Gasparro. 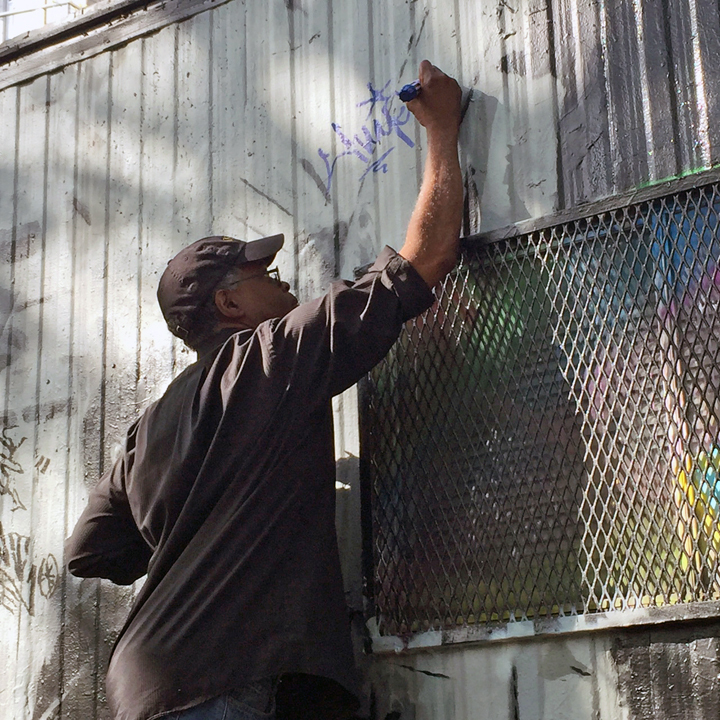 “KR was a master of paint at a time in graffiti when there were more court jesters than kings, more tags and throw ups than masterpieces.” Earlier this week, I had the opportunity to catch up with the impassioned artist while visiting his studio. 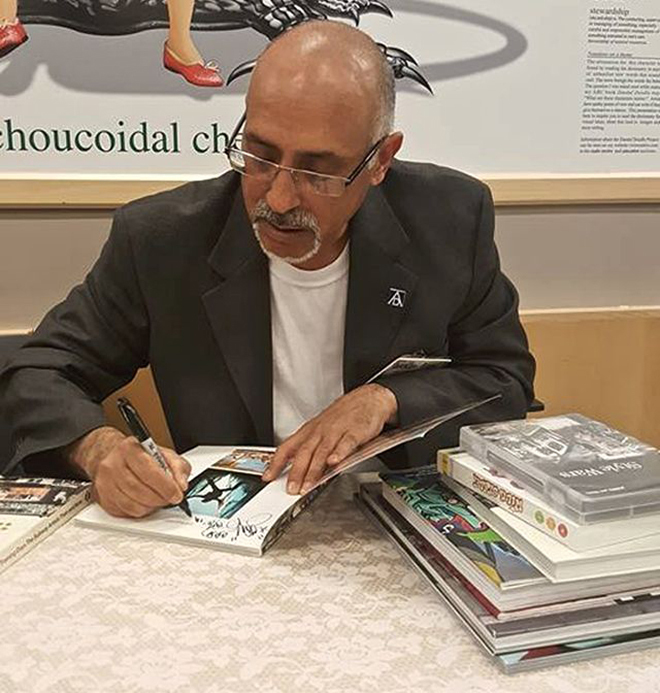 It’s been almost three years now since your first book Don1: The King from Queens was launched with a panel discussion at the Museum of the City of New York. How has the response to that book been? The response has been overwhelming. 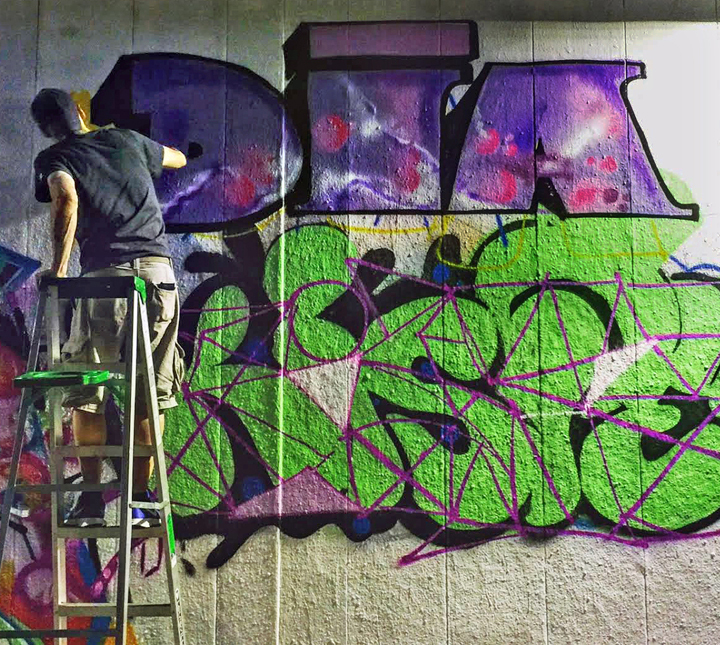 I put a light on a NYC graffiti master who had been forgotten. He had influenced so many of us, but was living in obscurity. I was determined to uncover his story and share it with others. I spent nine years doing that. But my persistence paid off. I had folks from Italy writing to me after the book was released. And what about your current book? It’s quite impressive! How did that come about? While working on Don1: The King from Queens, I developed a relationship with its publisher, Schiffer Books. And when I proposed a book of my own works, I was encouraged to see it through. I love the way your new book is organized into distinct chapters on different themes — such as The Early Days, Black Books, Model Trains, Abstracts, Walls and more. 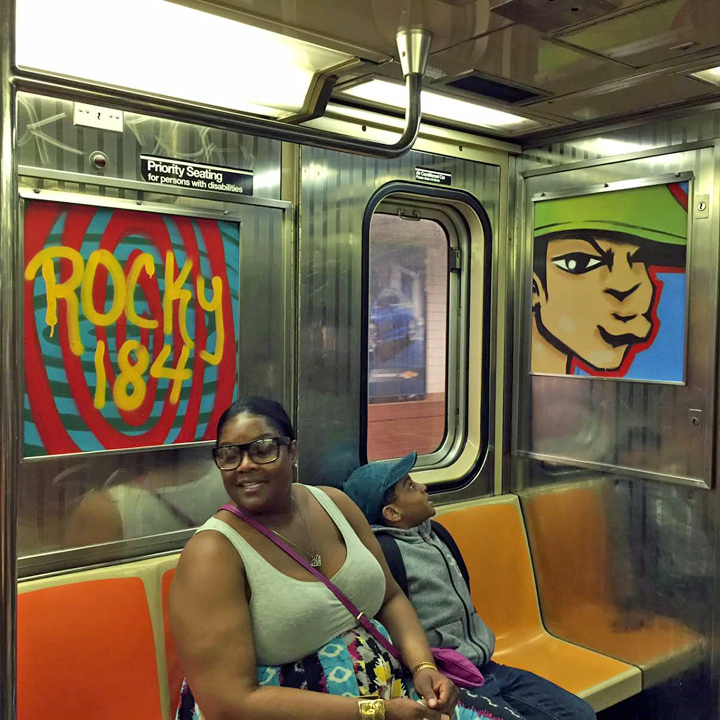 There is such an amazing variety of works and styles represented here, as well as a documentation of your journey as an artist — from subway graffiti pieces dating back to the early 80’s to contemporary urban art. How long did it take you to get it all together? I spent two years working on it. The greatest challenge was deciding which works to include. Originally, I had 600 images. I then had to cut that down to 400. Kolorstorm is also an amazing foray into your inspirations and passions. Can you tell us something about your influences? Who were some of your favorite musicians back then? 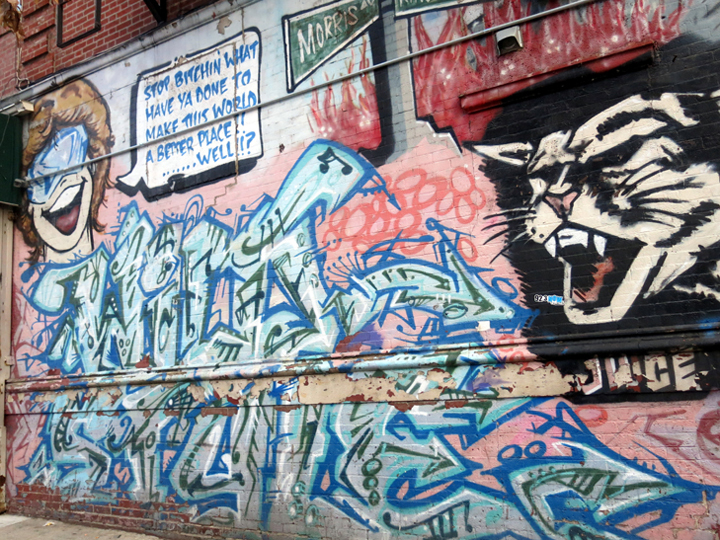 Among them are: Jimi Hendrix, Rush, Yes… For me — and for many of us — graffiti was never related to hip-hop. 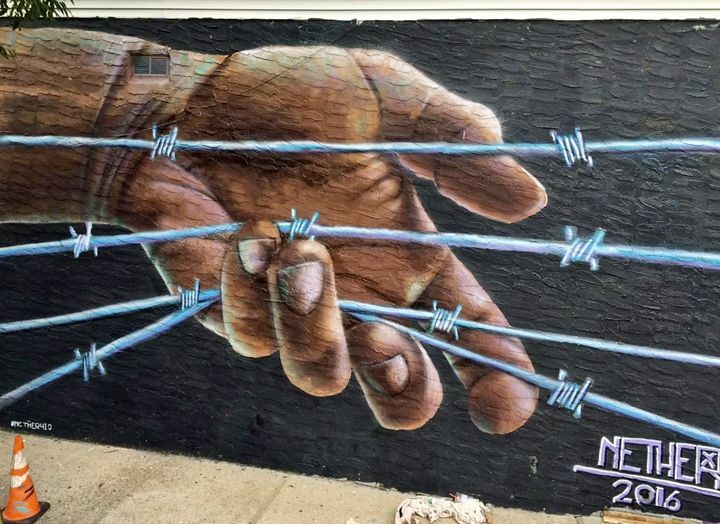 The connection was largely an illusion that was accepted by many as “fact.” Graffiti transcends all concepts of race, religion, culture and class. That’s what makes it so great. In what ways has your work evolved through the past few years? The entire process has become easier. My artwork is more detailed, and my line works are better. Your Abstrakts are on a whole different level! What inspired them? I was just experimenting with colors and shapes. 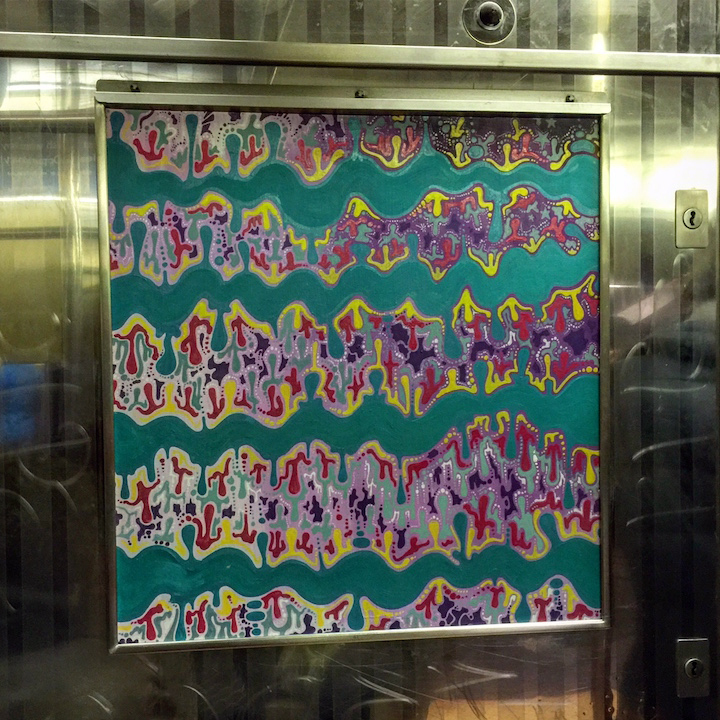 The Abstrakts evolved from the experimentation. I’ve been told that they are “informed by graffiti.” And so they may be! More art, of course! 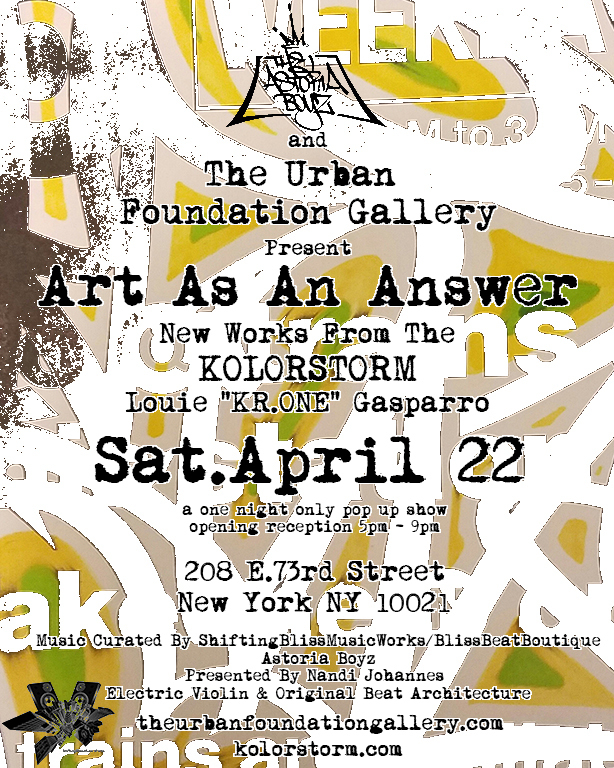 And opening Saturday (tomorrow) night is Art As An Answer, a one night only pop-up show with new works, presented by The Astoria Boyz and The Urban Foundation Gallery, at 208 East 73rd Street in Manhattan. Congratulations! It’s certain to be wonderful! 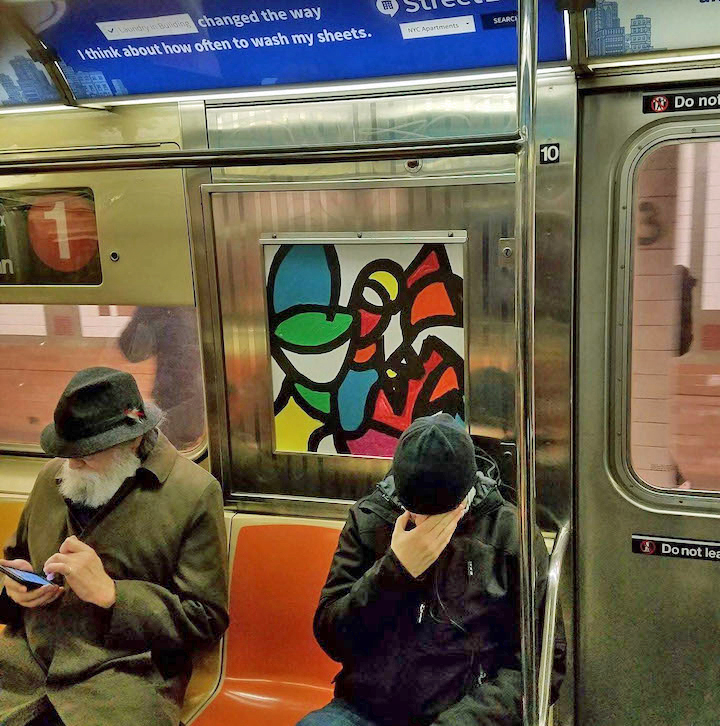 Note: Hailed in a range of media from Wide Walls to the Huffington Post to the New York Times, our Street Art NYC App is now available for Android devices here. 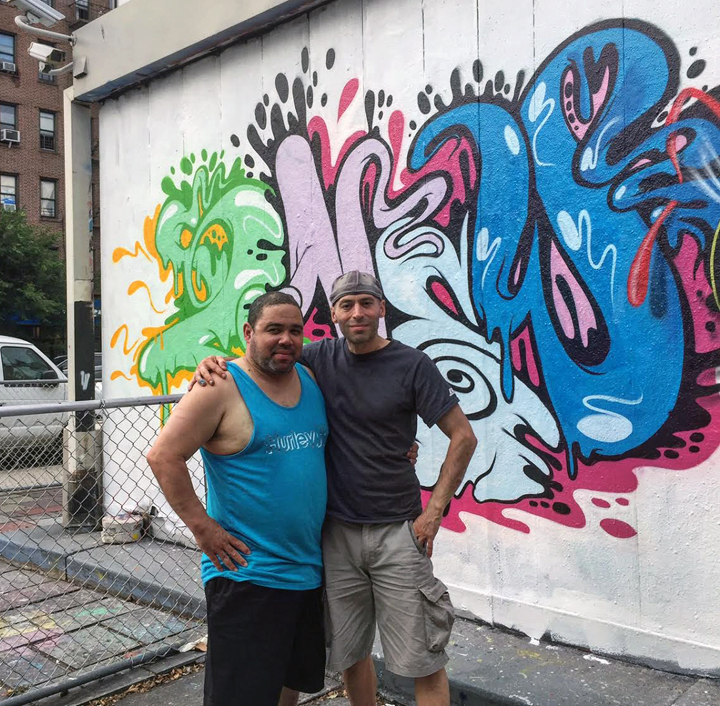 I met up with several members of the East Coast – and original – MSK crew while they were painting up in Inwood earlier this year. Among the writers I spoke to were: Kister, its current president; Dia One, MSK’s president back in the 80’s and its legendary former vice president, 2 New. (Note: pictured above is 2 New to the left of Dia One). When was MSK first founded? And by whom? 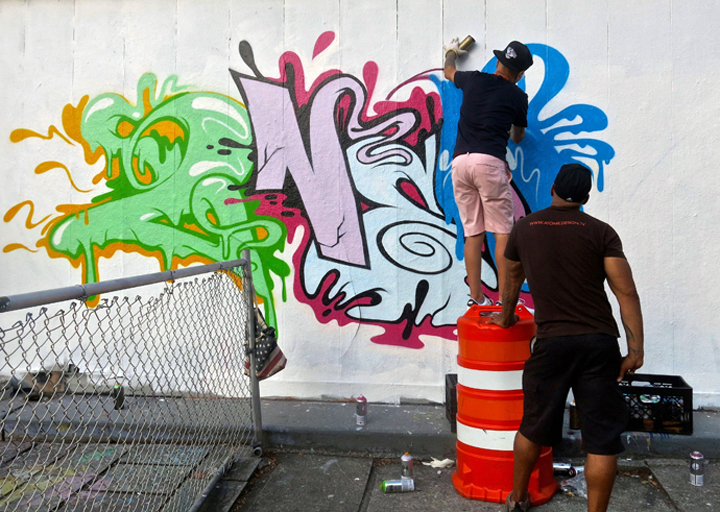 It was founded in 1982 by MADE and WASE, along with a few other writers who attended IS 52 — right here in Inwood. 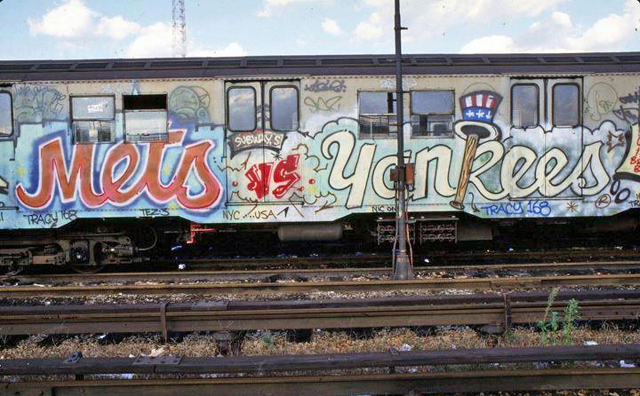 Which trains was MSK hitting back in the day? 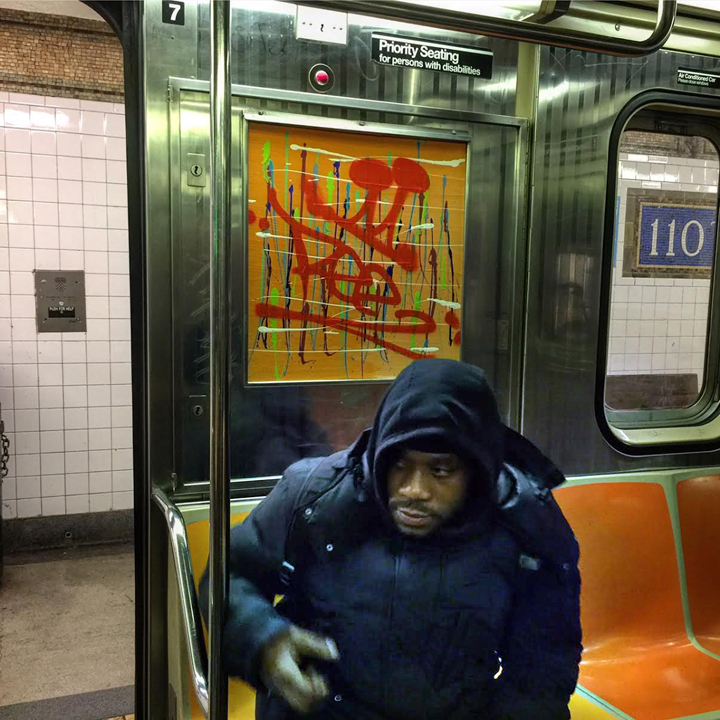 Any one nearby – the 1 train, the A, the AA, the C, the CC, the RR and sometimes the D and B. How were the original MSK crew members regarded back then? 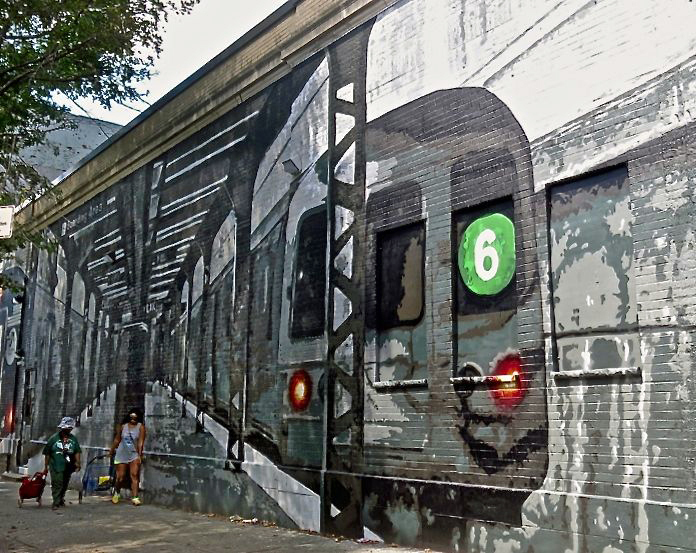 All of us growing up in the Heights and here in Inwood had enormous respect for them. Everyone knew them and looked up to them. 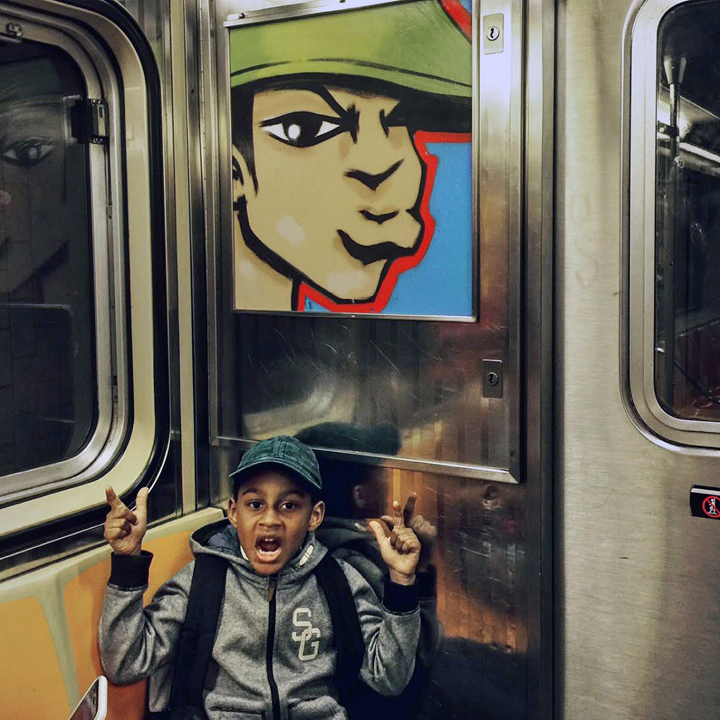 Can you give us a sense of what it was like hitting the trains back then? We followed a routine. Five or six of us would gather in a friend’s house. We’d design an outline. Then we’d rack the paint from a local hardware store. And once we had the paint, we’d pick a yard and sneak in. And once you got into the yard? We had to worry about gangs, dogs, cops and stepping on the 3rd rail. Success was getting out alive and taking a photo. Do any particular memories stand out? 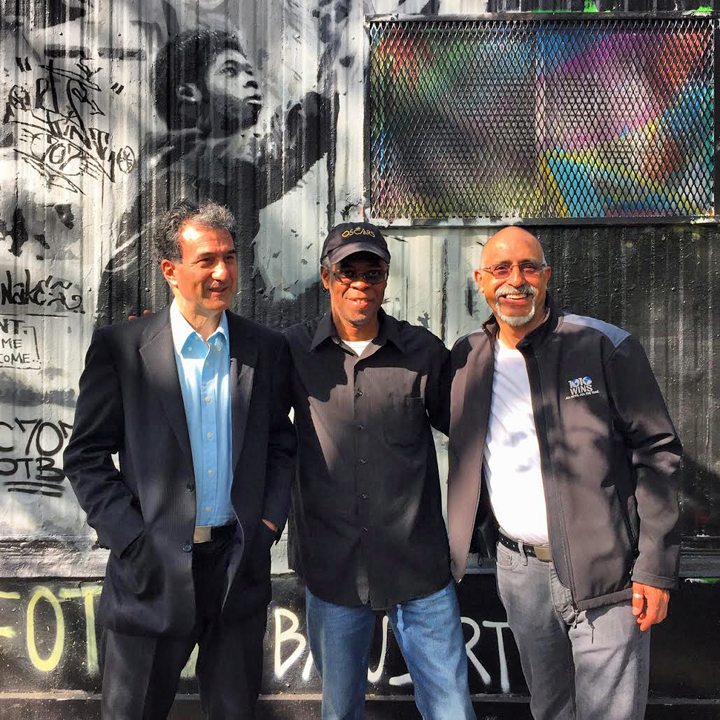 When three young MSK guys went to the 145th Street lay-ups and had their cans taken away by members of Jon One’s crew. We had to retaliate, and we ended up eventually beating the crap out of two of them. The drama only continued, and eventually Jon One left NYC for Paris. As the train era ended in the late 80’s, what surfaces were MSK’s second and third generation hitting? Mostly highways, rooftops and handball courts. And because we had to be fast, we mostly did bombs and throw-ups. We didn’t have time for pieces – except for occasional ones on handball courts. 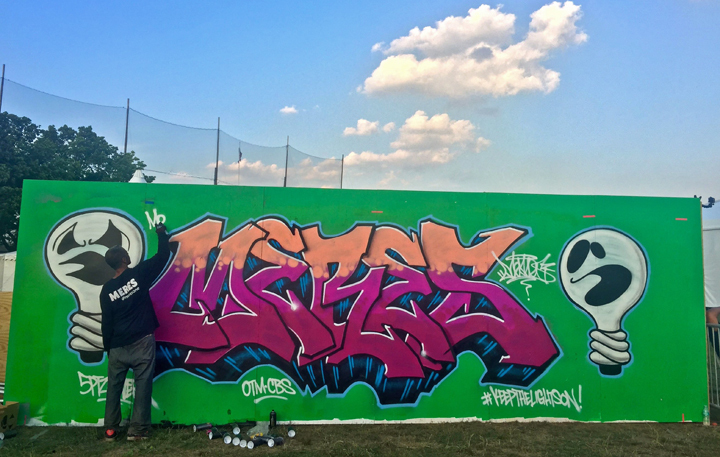 Here you have members of all three generations of MSK working together – painting on a legal wall. Yes, we do it because it’s fun. It’s our way of celebrating our culture. And how does painting on a legal spot like this one differ from working illegally? On a legal space like this, we can take our time and make as many changes as we want as we work. 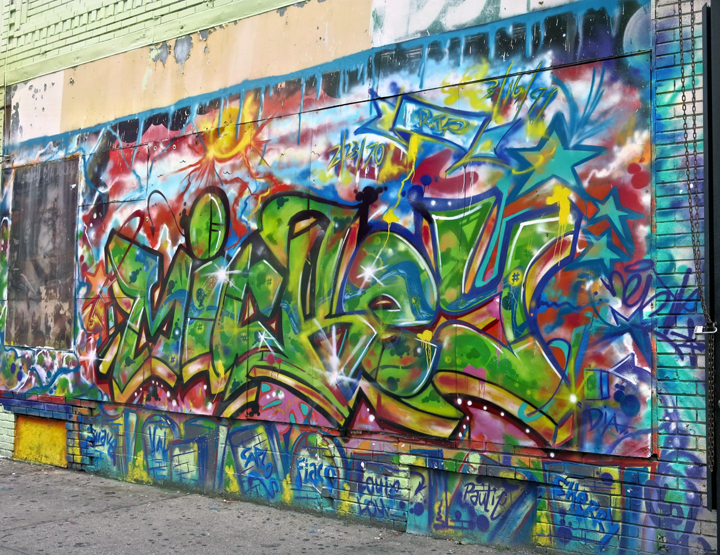 But when we paint on walls like these, we can’t get the adrenalin rush that comes with working illegally. It’s not the same — nowhere close! And we miss it! 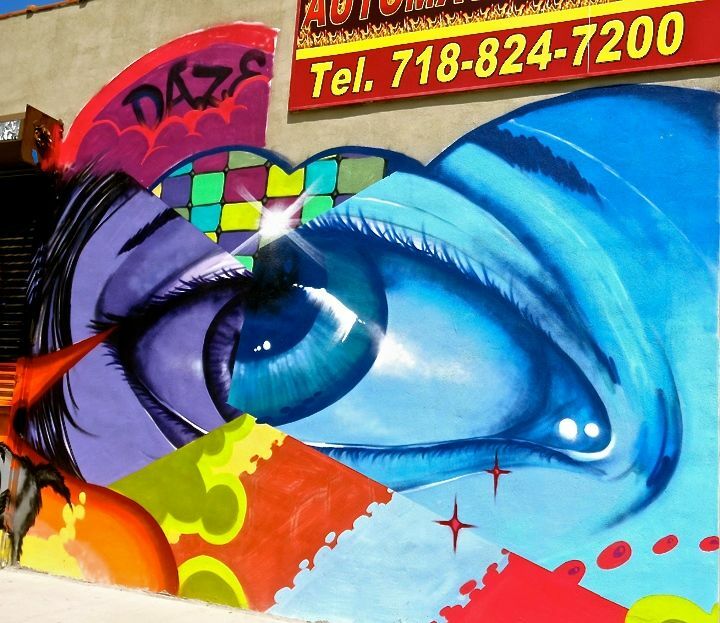 Founded and curated by SinXero, the TAG Public Arts Project — a A 501(c)3 Not for Profit in NY State — continues to bring a wonderfully diverse range of public artworks to the South Central section of the Bronx. 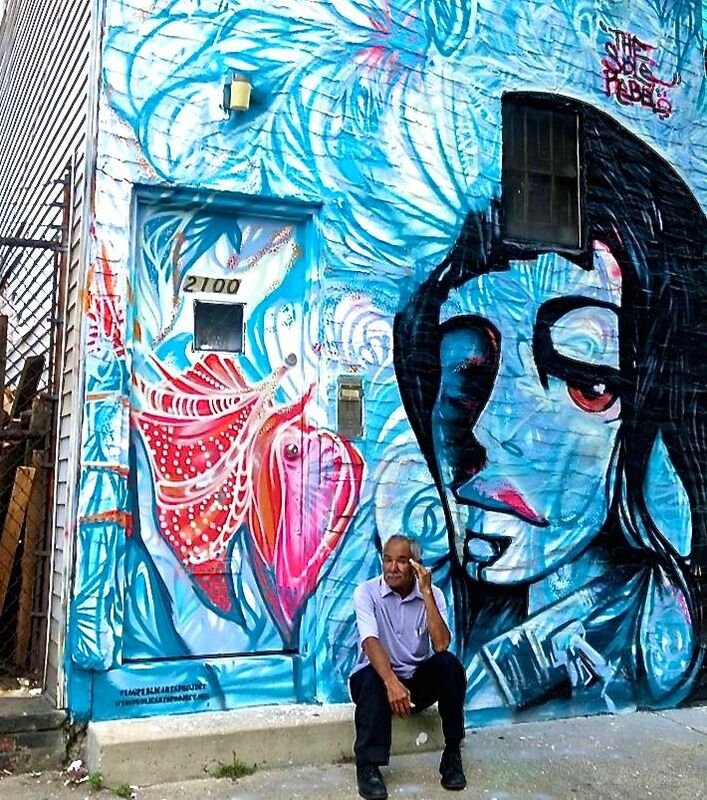 Pictured above is a mural recently painted by Baltimore-based artist Nether 410. 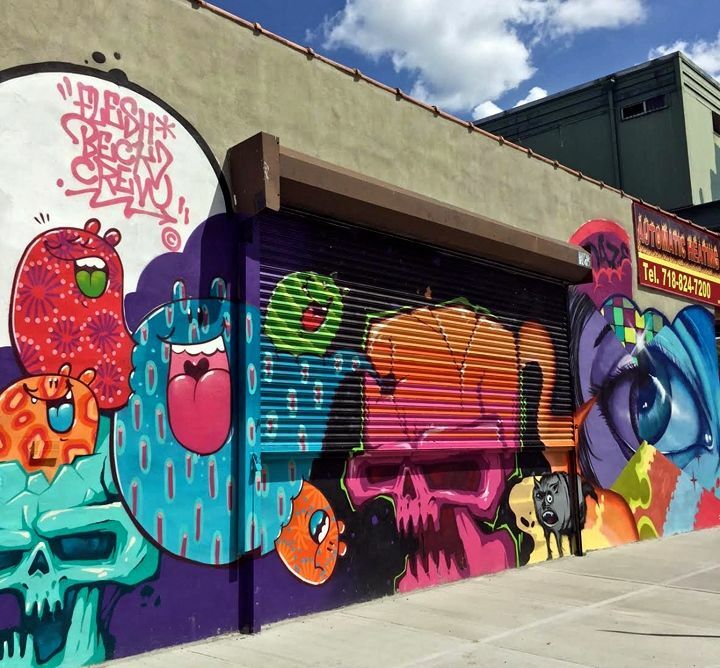 Here are a few others — fashioned by local, national and international artists — that I came upon this past Friday while exploring the streets on and off Westchester Avenue along the 6 line. 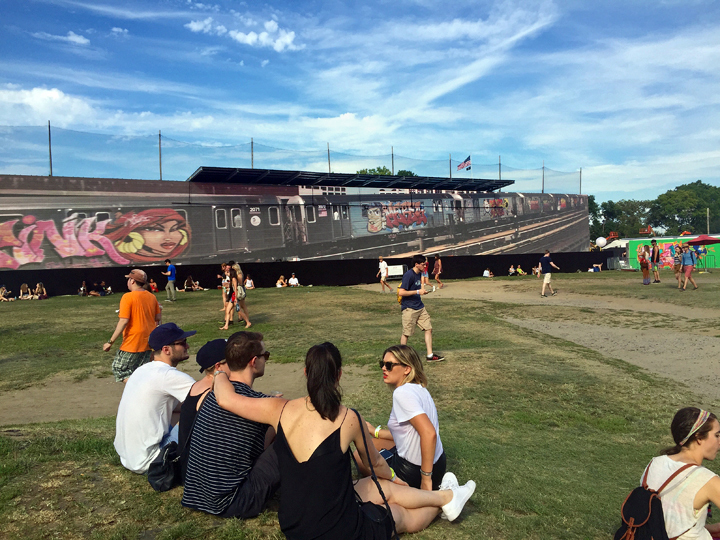 All-City Express, a hugely impressive interactive art exhibition, made its world premiere last weekend at Randall’s Island’s Panorama. 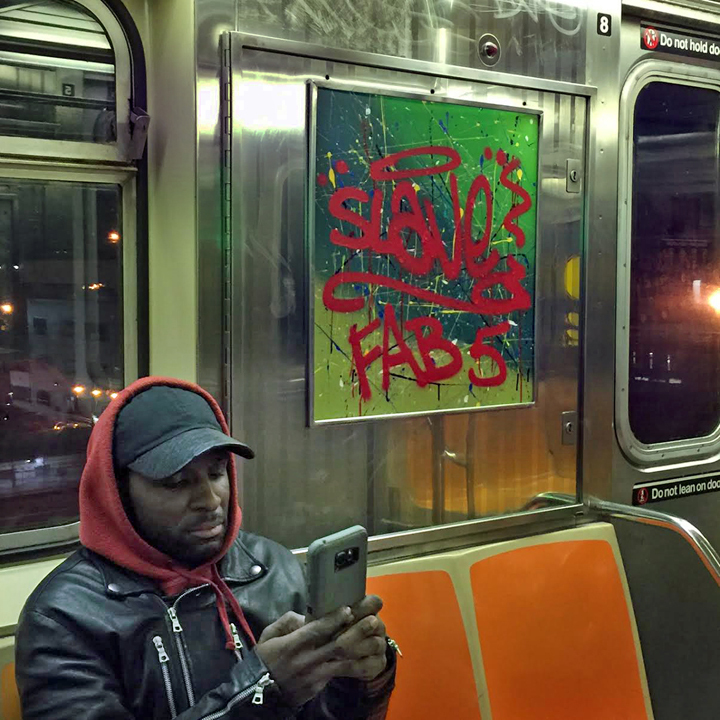 Under the curatorial direction of 5Pointz Creates leaders Meres One and Marie Flageul, Lady Pink, Tkid 170, Toofly, Meres One, Jerms, Topaz, and See tf painted live, covering digital subway cars with original artwork. 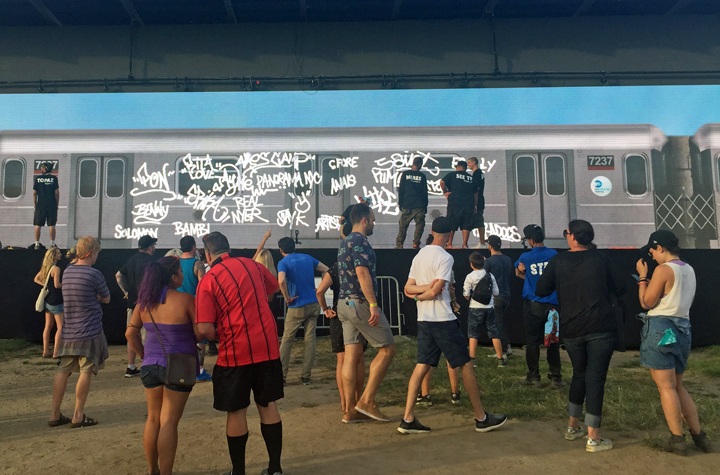 Fusing graffiti’s underground roots with innovative video technology, the project was developed by Brooklyn-based AST Studios with Tangible Interaction. 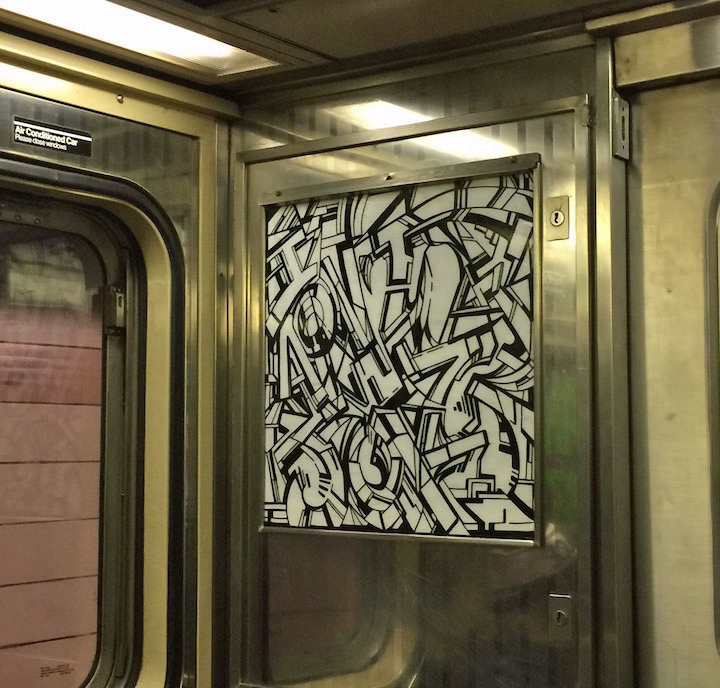 Here are a few images captured in the course of this three-day cutting-edge homage to traditional graffiti art. Note: This blog will be on vacation through Sunday, August 7. You can follow us on Facebook and on Instagram. 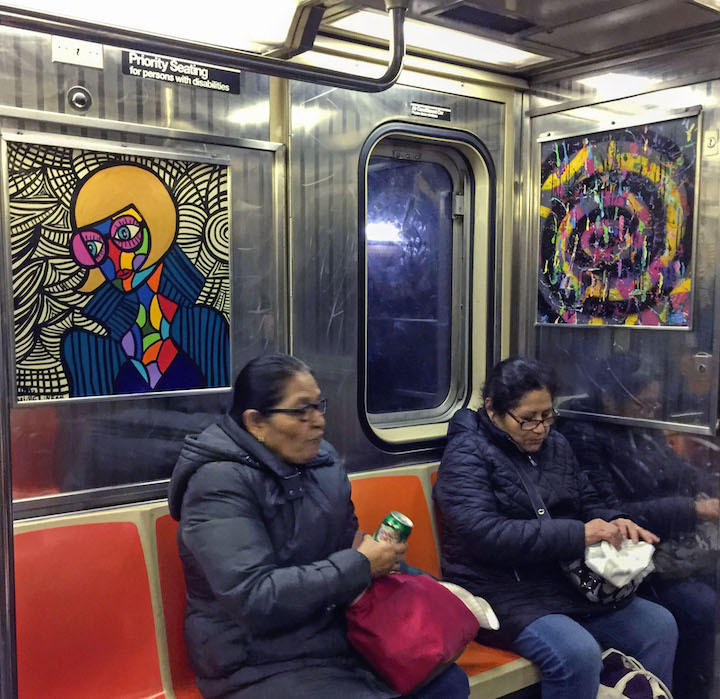 Hailed in a range of media from the Huffington Post to the New York Times, our Street Art NYC App is now available for Android devices here. When did you first get up? I first got up with a crayon on a wall in my house when I was four years old. I remember drawing a tortoise and a hare. 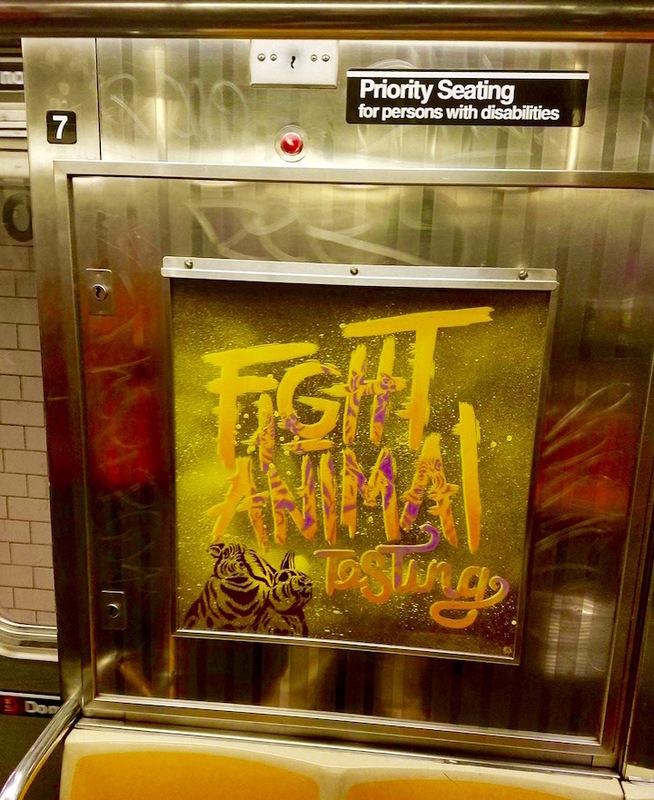 I lived across from the Bronx Zoo, and I always heard the sounds of animals from my window. What about the streets? When did you first hit the streets? And the trains? When did you first hit them? In 1969 when the Mets won the World Series, I first hit the streets. 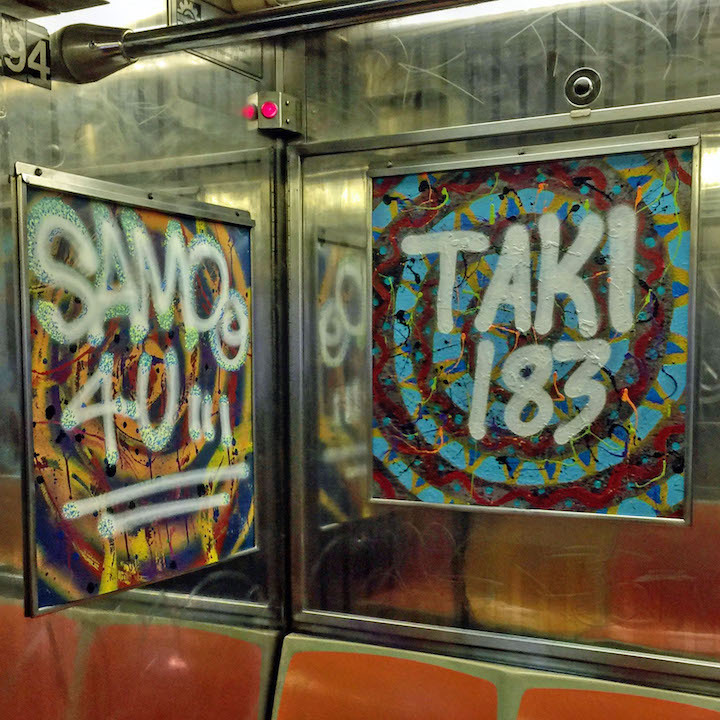 And I tagged my first train the same year. I was 11. What inspired you to do so? I loved the sense of adventure…the adrenalin rush. I envisioned myself as a Tom Sawyer or Huckleberry Finn. 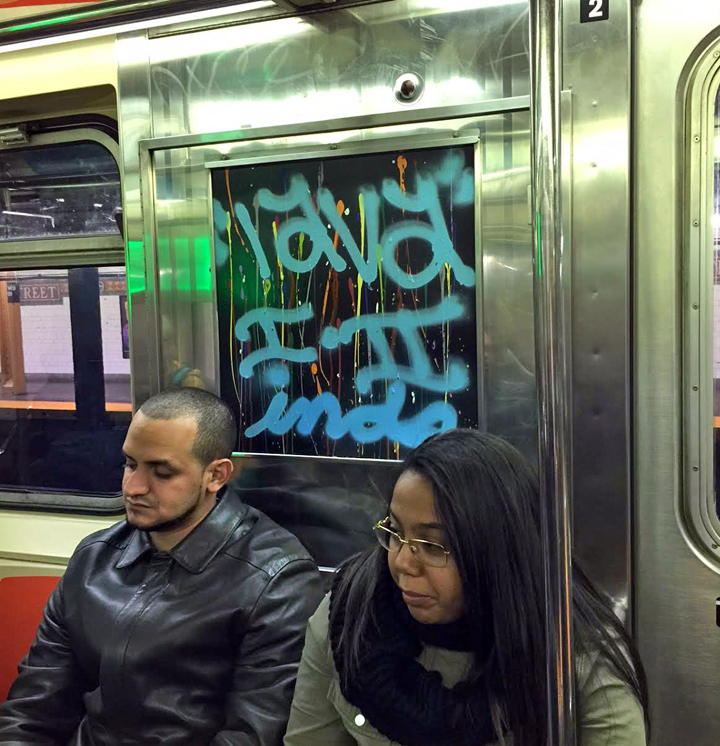 And I loved seeing my name on the trains. Had you any favorite spots? I was all-city, and I loved painting anywhere with people whom I loved. But my favorite spots were New Lots Avenue and Utica Avenue on the IRT line in Brooklyn. 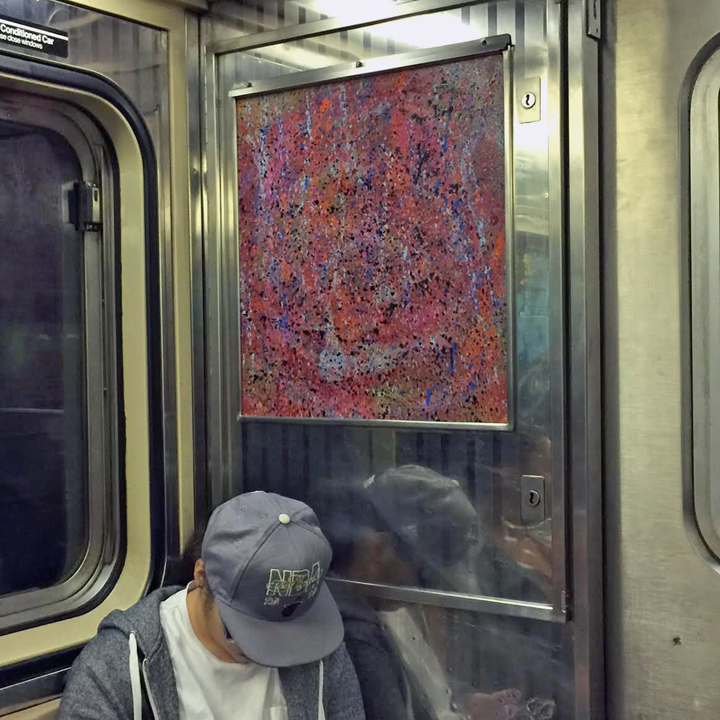 Any train I painted there would run right away, and so I didn’t have to hang around too long to see my piece pass by. What about crews? Did you get up with any crews? I founded the Wanted crew. It was one of the largest crews ever, and just about anybody who was anybody of worth was in that crew. 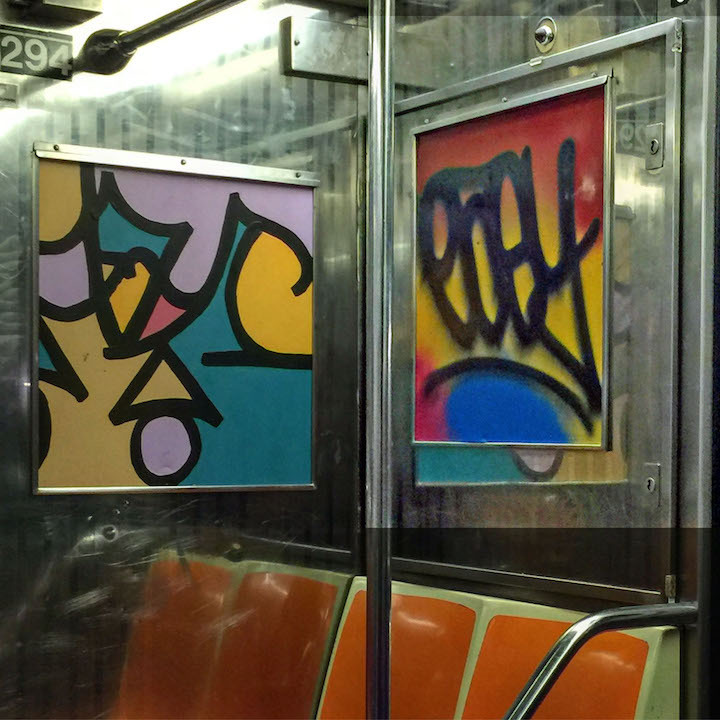 It represented Wild Style. Had you any early role models or inspirations? Any particular risky ventures stand out? I was always wild, always doing dangerous things. How did you support yourself back in the day? What was your source of income? 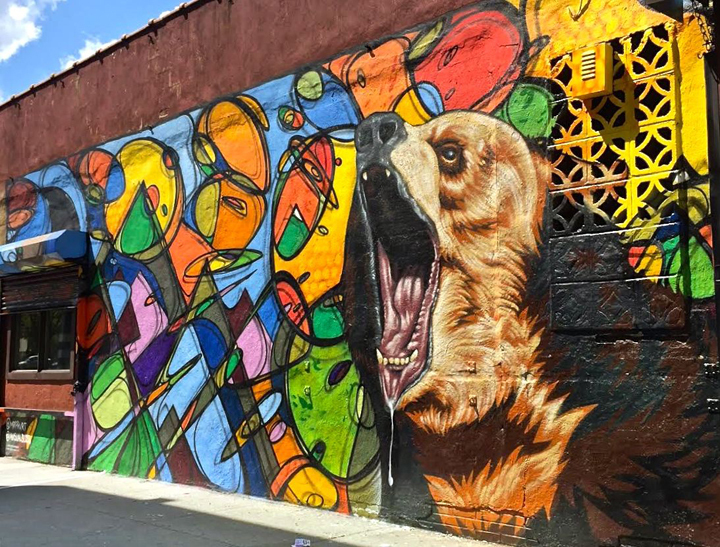 In the late 70’s, I began to create all kinds of art-related jobs for myself — painting storefronts, memorial walls, murals… I was the first writer to do that kind of thing. I also worked in an advertising agency. Jack Stewart taught me about copyrights and trademarks. He was a true mentor. He told me real stories — not the ones from Fantasy Island. Your work has been shown in all kinds of settings across the globe! Yes! I’ve been in museums and galleries all over the world. 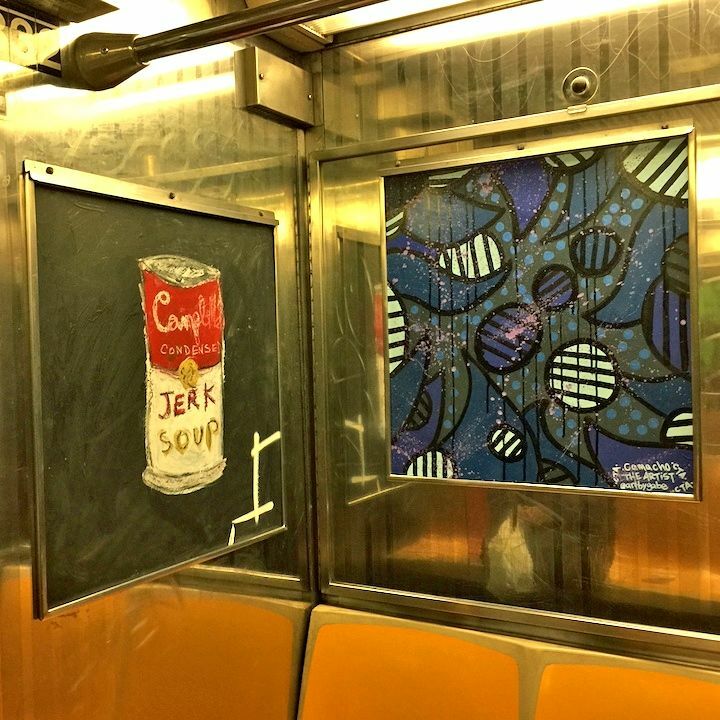 I was always breaking boundaries, Here in NYC my work has been exhibited in dozens of spaces including the New York Historical Society, the Brooklyn Museum and NYU. I remember seeing your work at the Brooklyn Museum back in 2006. Yeah! When I came by, I made some adjustments to my canvas with a paintbrush. That didn’t go over well with the security guards. They got the curator of the exhibit involved, who insisted that I couldn’t change anything, since it had already been photographed for their catalog. Did you have a formal art education? How do you feel about the role of the Internet in this scene? It can be used as a tool — if you know how to read the truth. What’s your ideal working environment? Anywhere outdoors. Even when I paint canvases, I like to paint outside. What inspires you these days? 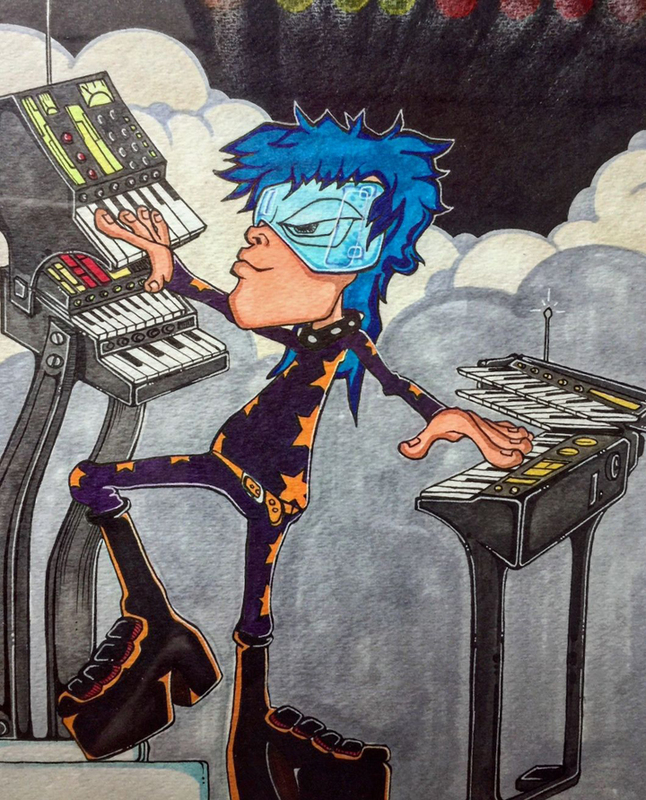 My main inspiration is to express myself and grow as an artist in a world that is reluctant to see me as one. Are there any particular cultures that have influenced your aesthetic? Every culture. 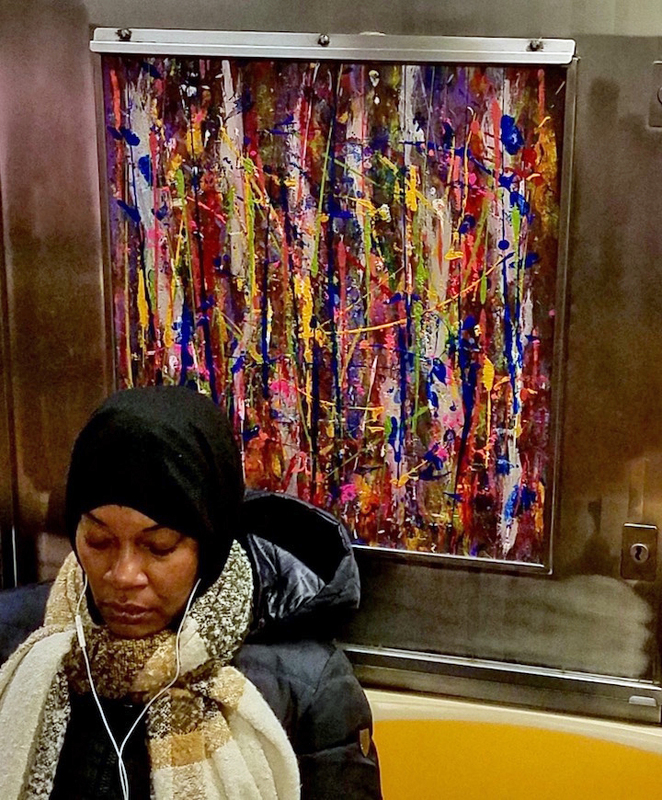 NYC is a melting pot, and I’m in the center of it painting. Are you generally satisfied with your finished piece? I’m not done until I’m happy. As long as I’m alive, I can improve on it. But it must have meaning and exude positivity. Otherwise, why bother? A few years back you were reported dead. What was that all about? If I hadn’t died then, I wouldn’t be alive now. It had to happen. When I vanished, I saw the world going in the wrong direction. This art form can save it. How has your work evolved in the last few years? It’s constantly evolving. This movement is to art like jazz is to music. It’s a fusion of styles and cultures that knows no boundaries. It is a universal language. 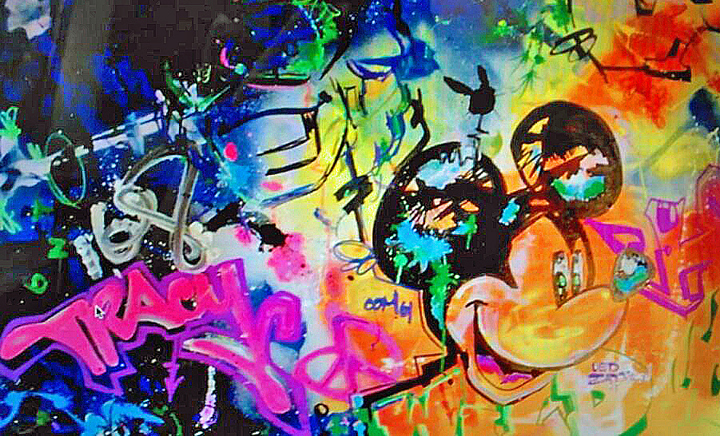 And the message of Wild Style is “Be yourself. Find out what your talent is and get good at it.” I love everyone, but I will not surrender the truth and lose my integrity. Note: Photos 7 & 8 were captured from Tracy’s current black book; special thanks to Flint for the introduction! 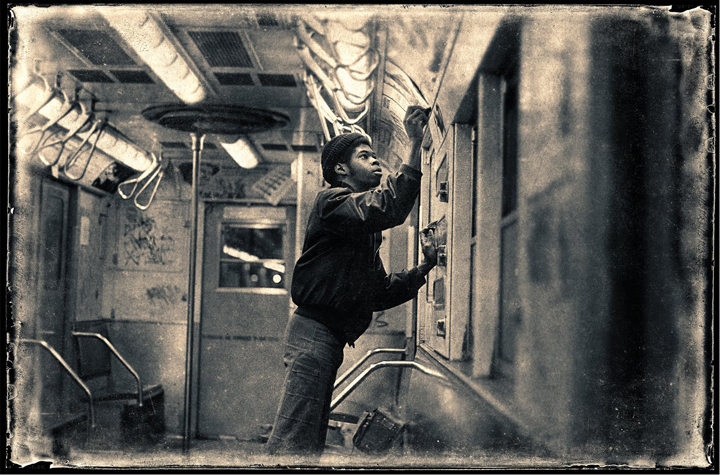 A pioneer of the graffiti movement, Charles Henry aka FLIP One was immortalized in Flint Gennari’s classic photo of him tagging a Coney Island-bound train over 40 years ago. 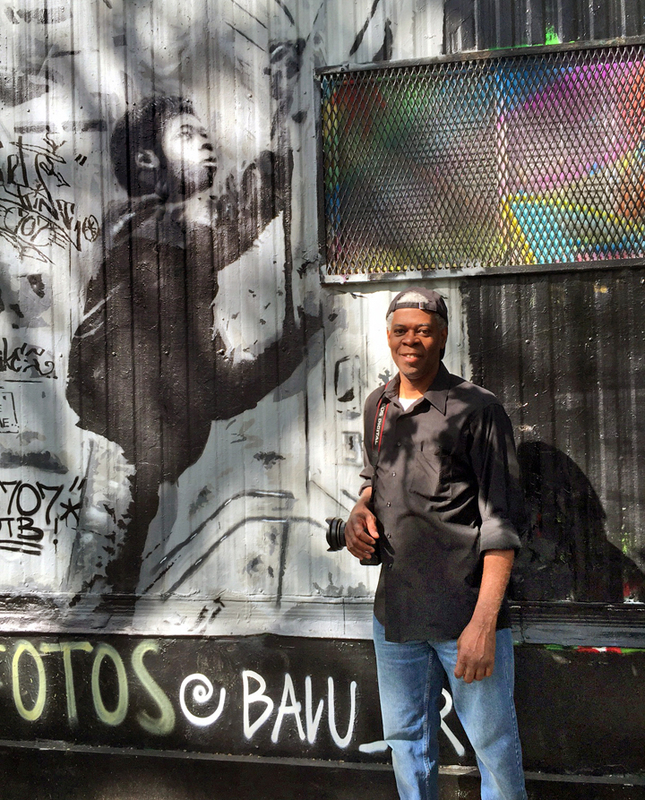 And this past spring the now-iconic photo made its way onto a stencil fashioned by Balu for the Centre-fuge Public Art Project. 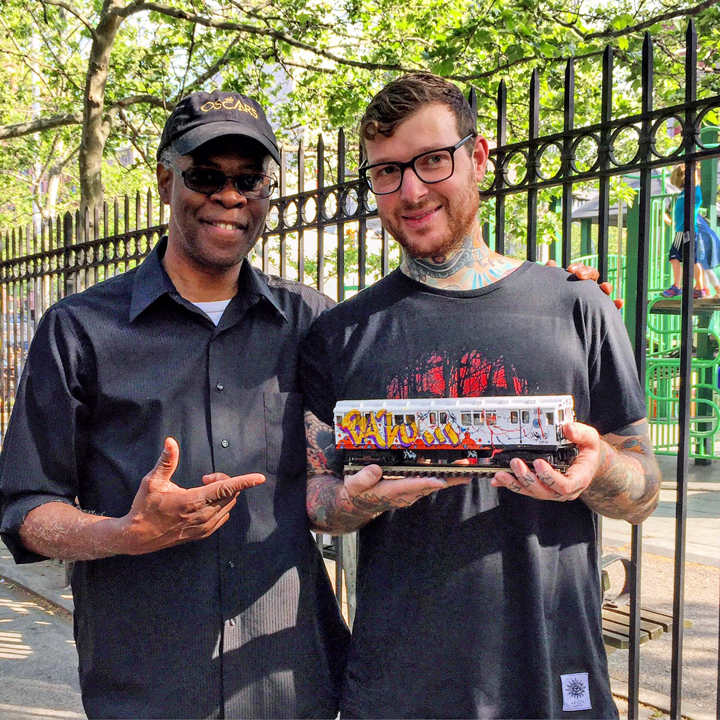 I met up with the artist — now an LA-based Emmy award-winning cinematographer — while he was visiting NYC last month. When and where did you first get up? It was back in 1974 in Propsect Park, Brooklyn. I was 15. Flint’s writings were everywhere in my neighborhood. He was my main inspiration. He also got me into photography. Other writers such as Spin, Coco 144 and Mico also influenced me. And I loved the adrenalin rush hitting the trains late nights and the little bit of fame watching my name go by. What was your preferred surface back then? How did your family feel about what you were doing? They were not happy. 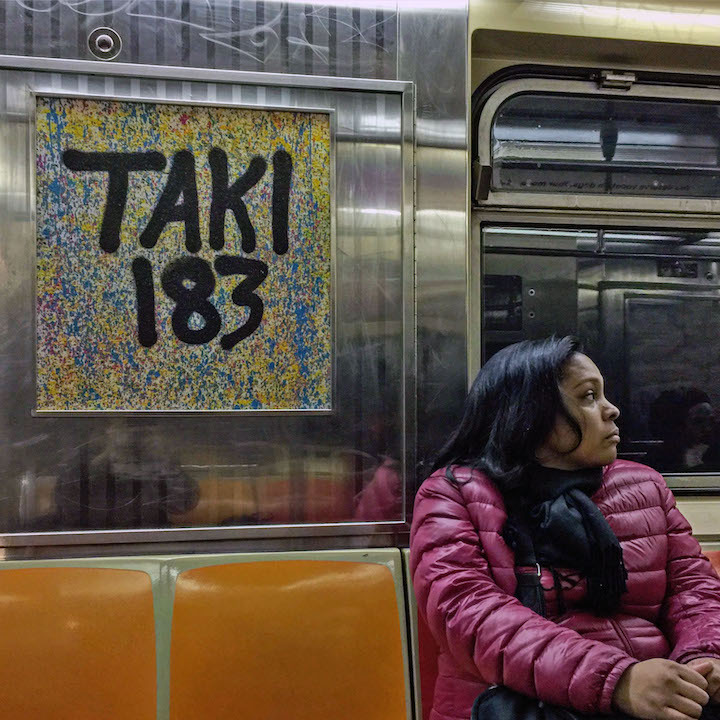 My dad used to work for the MTA. 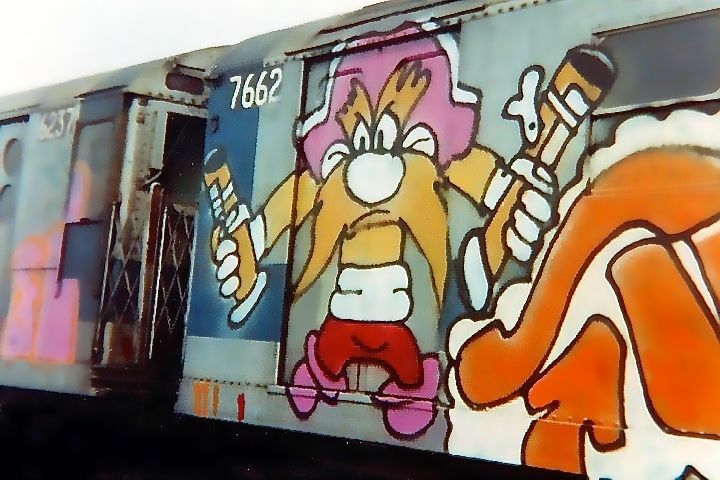 Do you have any specific graffiti memory that stands out? 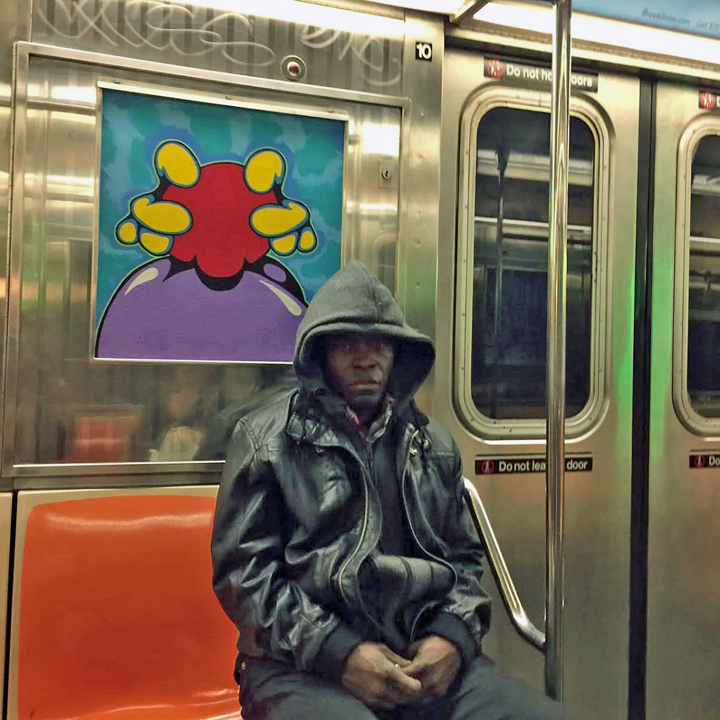 I saw once — and only once — an LL Cool J top to bottom while I was riding the train to school. I will never forget that! Did you work alone or did you collaborate with others? 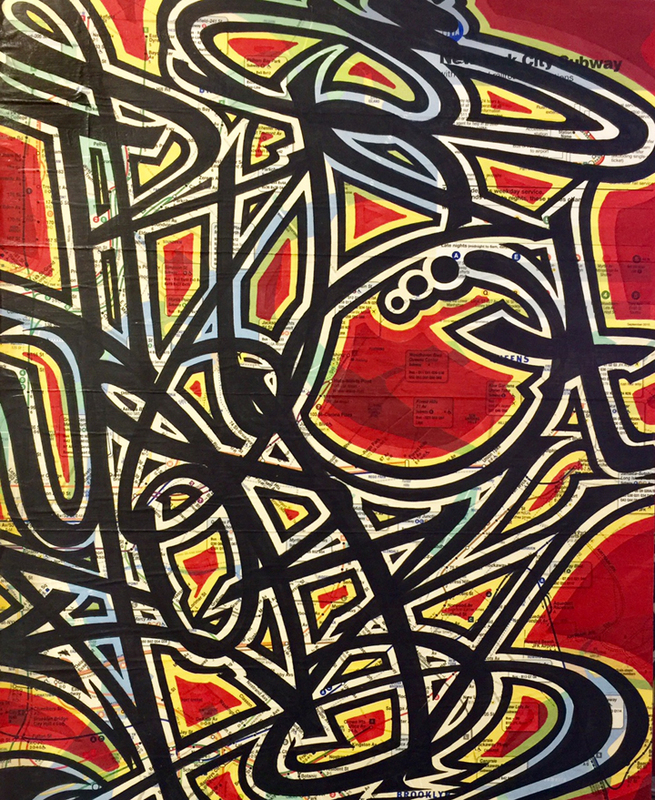 I painted with the Ex Vandals and the Soul Stoned Brothers (SSB). But I generally preferred working alone, because I didn’t want to draw attention to myself. What was the riskiest thing you ever did? Entering the 7 yard with Flint, Dime 139 and Asp across from Shea Stadium during a playoff game in the World Series. Luckily, the cops — who were supposed to be watching the yard — were too busy watching the game on their little black and white TV to pay attention to us! And so we managed to get in and out and do our thing in broad daylight without anyone noticing. 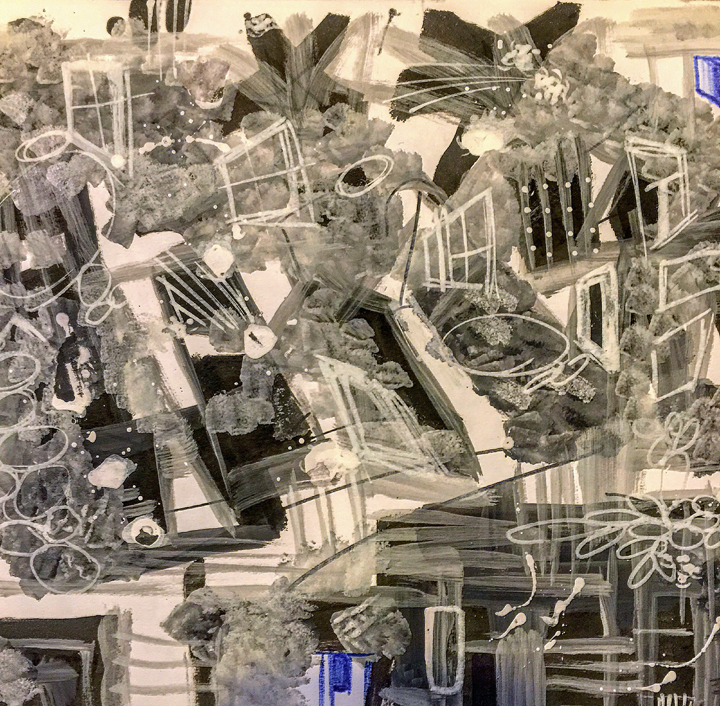 Has your work ever been exhibited? 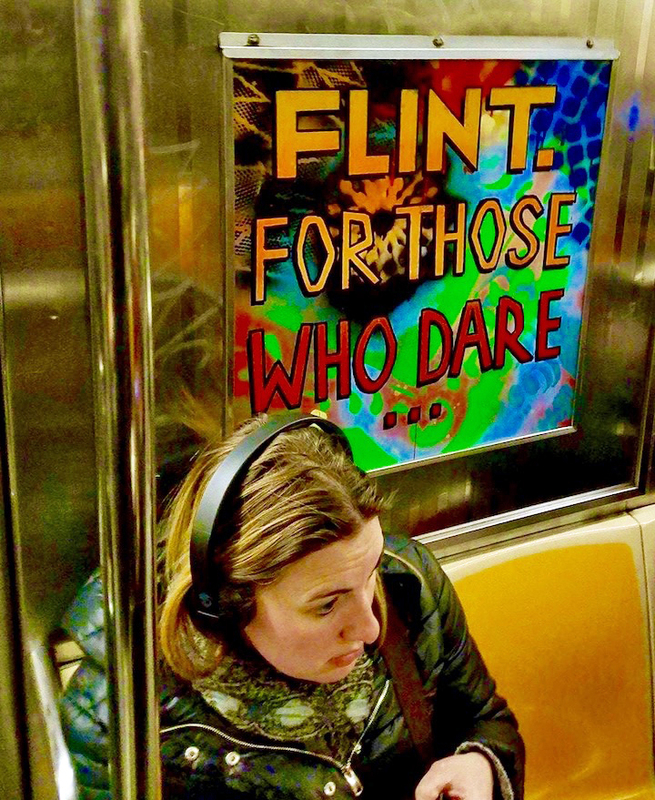 Yes, my work has appeared in Flint Gennari’s photos in several galleries and museums. 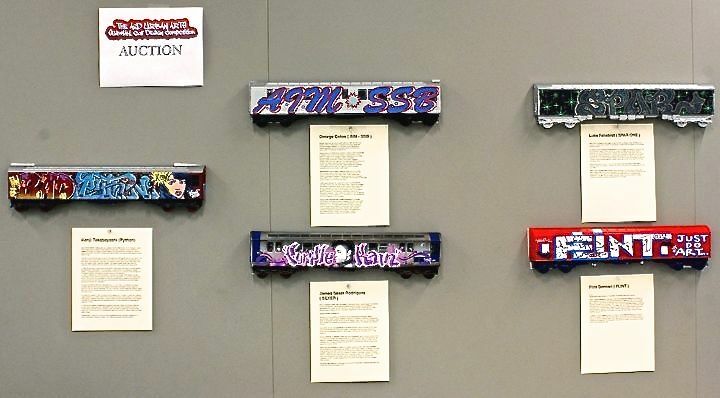 My small trains have been exhibited in galleries in LA. 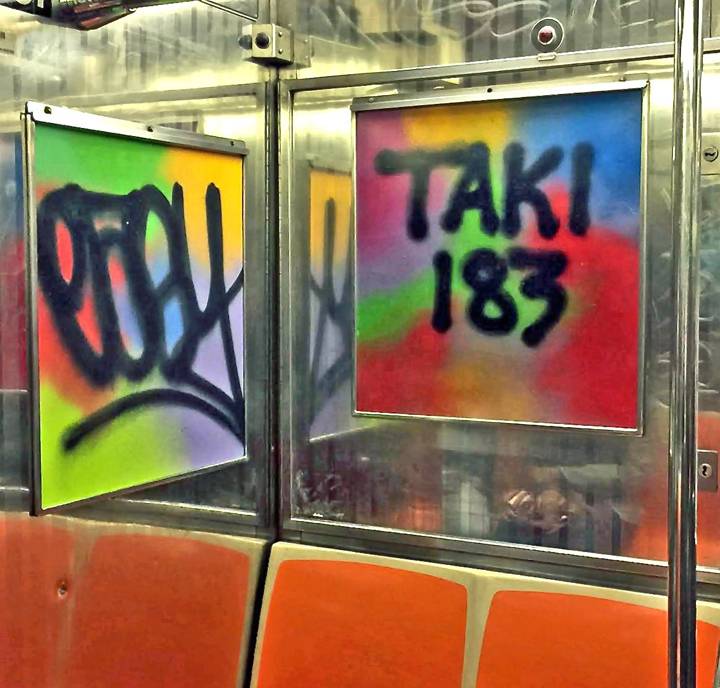 How do you feel about the movement of graffiti into galleries? I think it’s great! It suggests that what we did has meaning. 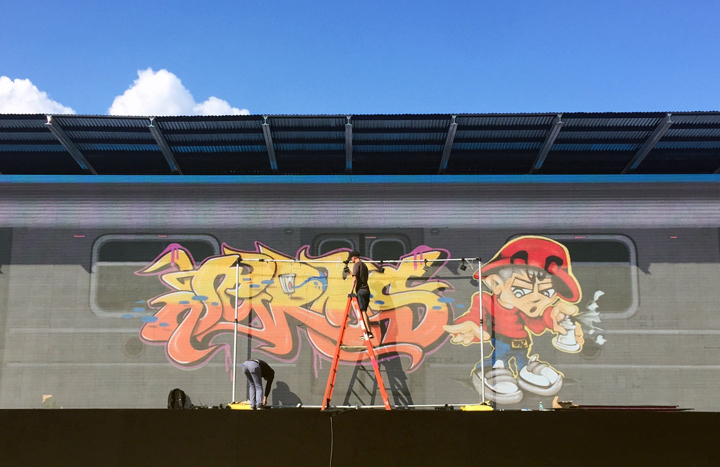 What about the increasing engagement of the corporate world in the graffiti subculture? I used to hate it, but it doesn’t bother me any more. Writers risked getting arrested, maimed — and more — for what they did. They should be paid! 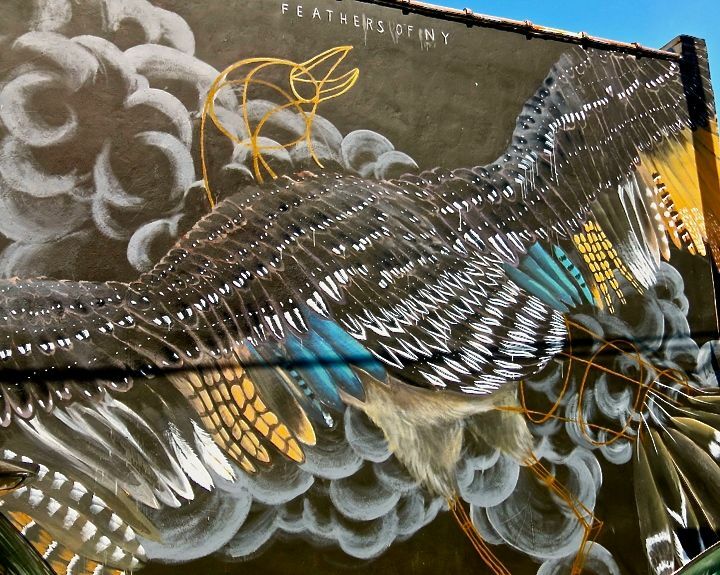 Have you any thoughts about the graffiti/street art divide? It’s not an issue. 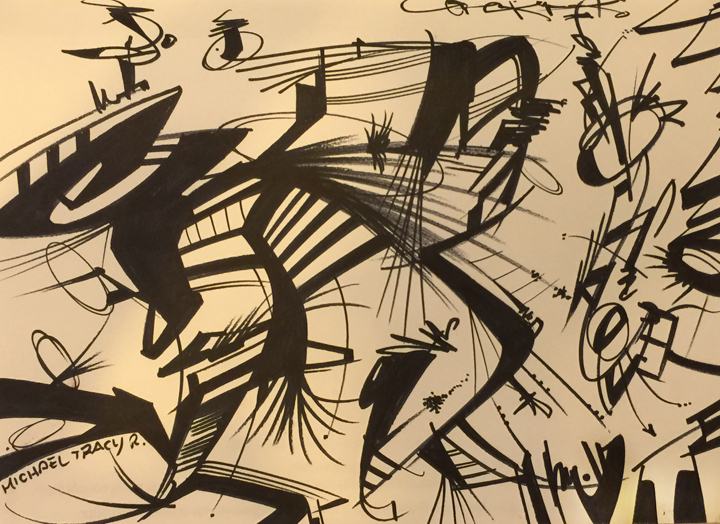 My favorite artists tend to blur the line between both: They include: El Mac, Retna, Obey, Man One and Revok. How do you feel about the role of the Internet in it all? I love it! I get to see the work of people I used to war against! 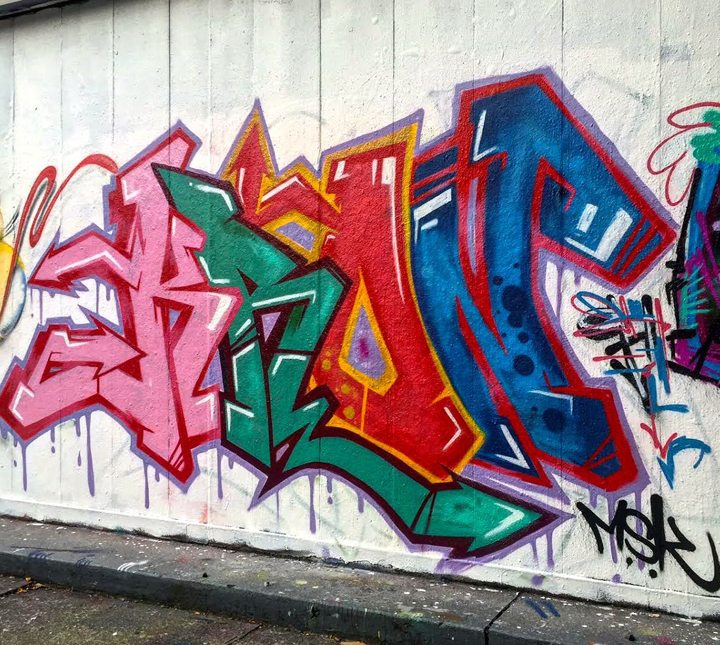 Any thoughts as to why the Europeans are more open to graffiti than most Americans are? I haven’t really thought about it, but maybe it’s because they place a higher value on self-expression. 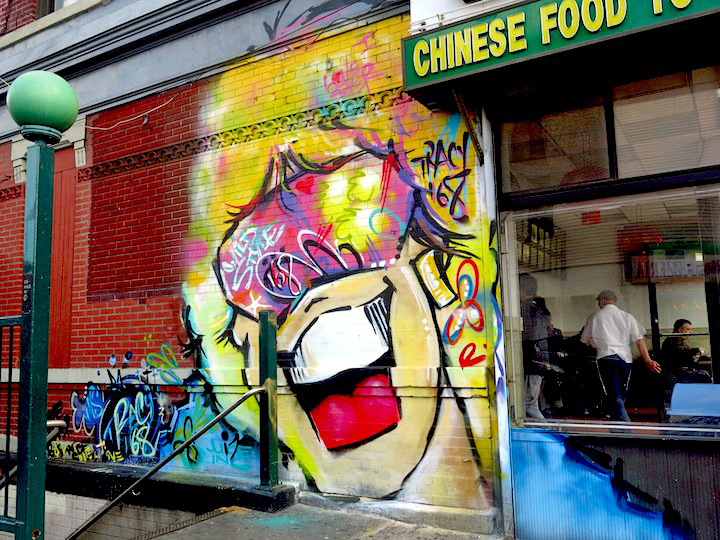 And there’s probably no art form more expressive art than graffiti! Note: Jan Arnold, the artist’s wife, is in the process of completing a documentary about Flip One’s life. Be sure to check its Facebook page here for some great photos and clips! 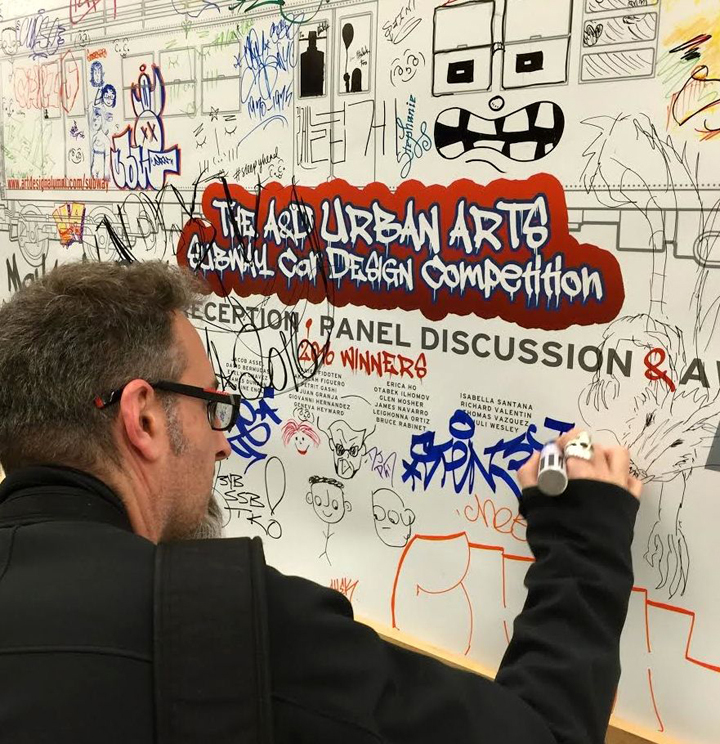 This past Thursday evening, the High School of Art & Design hosted a reception, exhibition and panel discussion honoring 20 student winners of its first A&D Subway Car Design Competition. 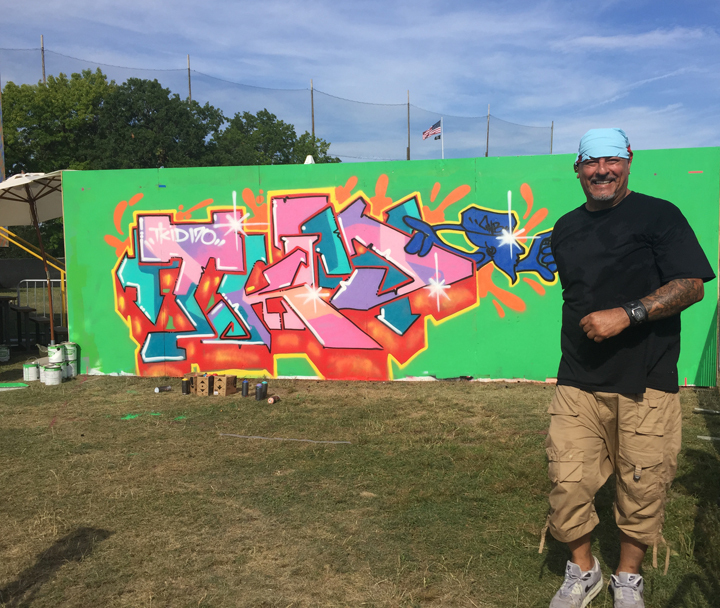 Soon after the event, I had the opportunity to speak to Art & Design alumnus and Old School graffiti writer George Colon aka AIM, who had invited us to this celebration of our favorite art form. Thursday evening’s event was wonderful. 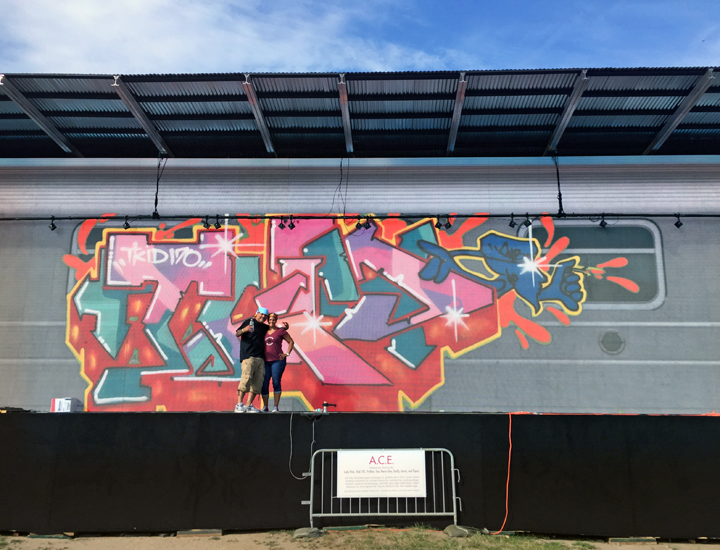 We loved the way it brought so many folks – students, alumni, faculty, parents, artists and us graffiti aficionados — together. Whose idea was it? 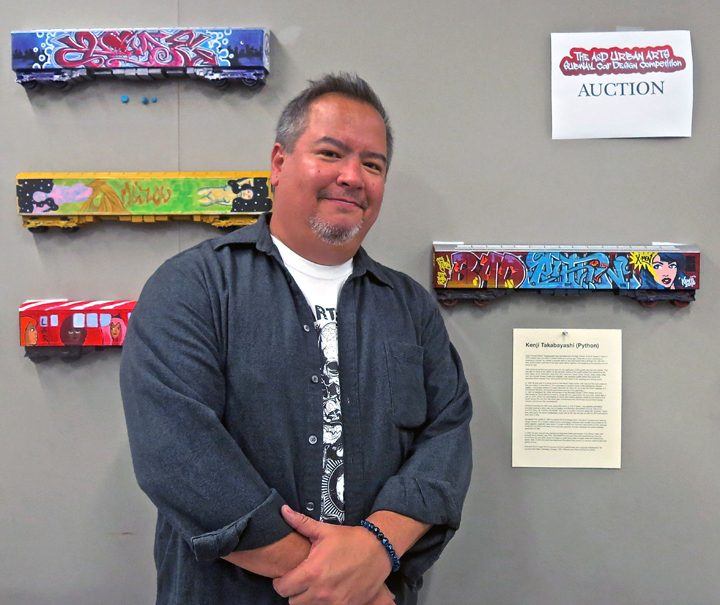 Two years ago, I presented the idea of a panel discussion on the theme of graffiti art to the school’s administration. 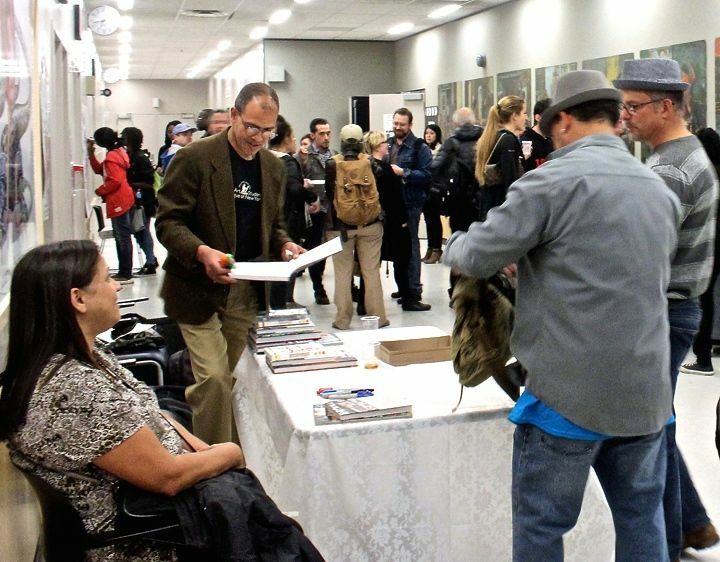 Art & Design seemed like the ideal site to host such a symposium, since so many famed writers are A&D alumni. 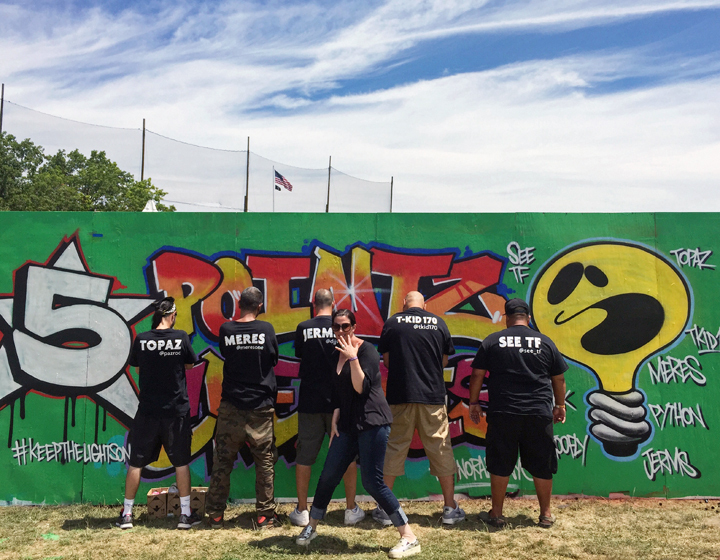 The faculty, though, was hesitant at the time to engage in a graffiti-related event. They were afraid, I assume, of negative reprisals. 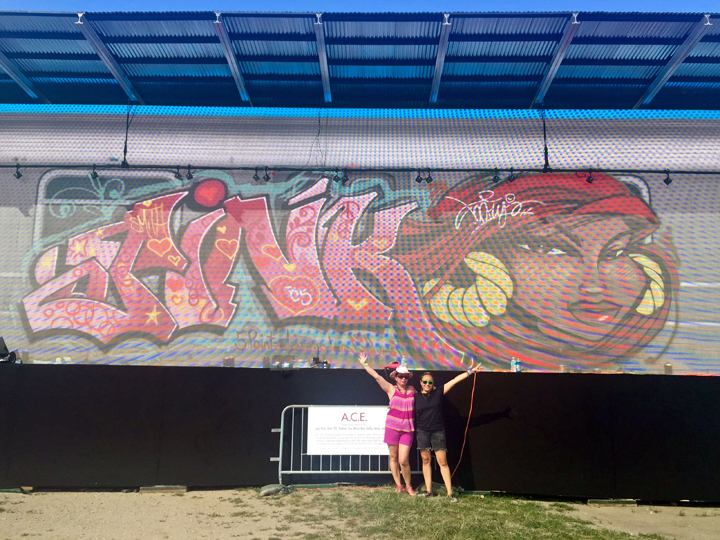 How, then, did last week’s amazing event happen? What caused the change? Why was the school suddenly receptive? There were several factors. First, there was a change in the administration. The new principal is open to new ideas and programs that he feels are in the students’ interests. 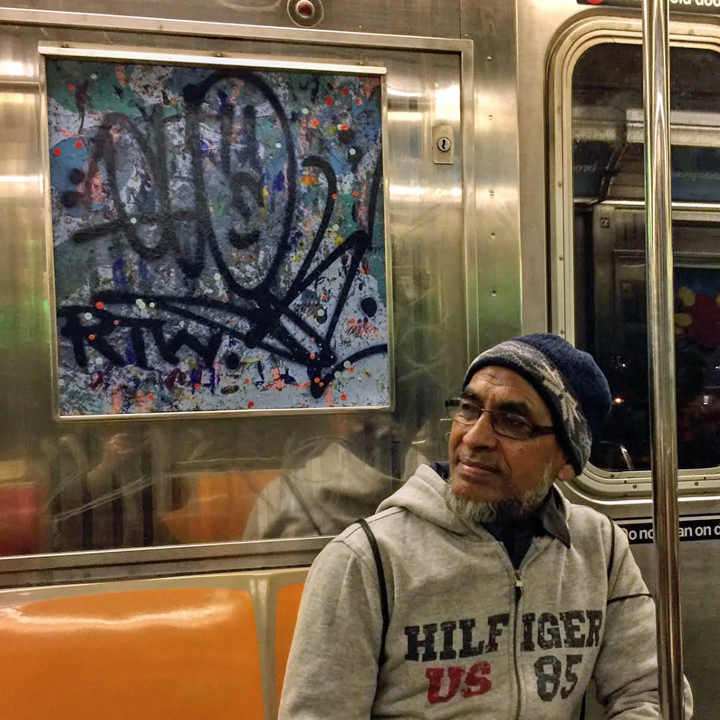 And I connected with A&D alumnus, George Alonso, who was in touch with Klim Kozinevich — the designer of the All City Style Blank NYC Subway Cars. 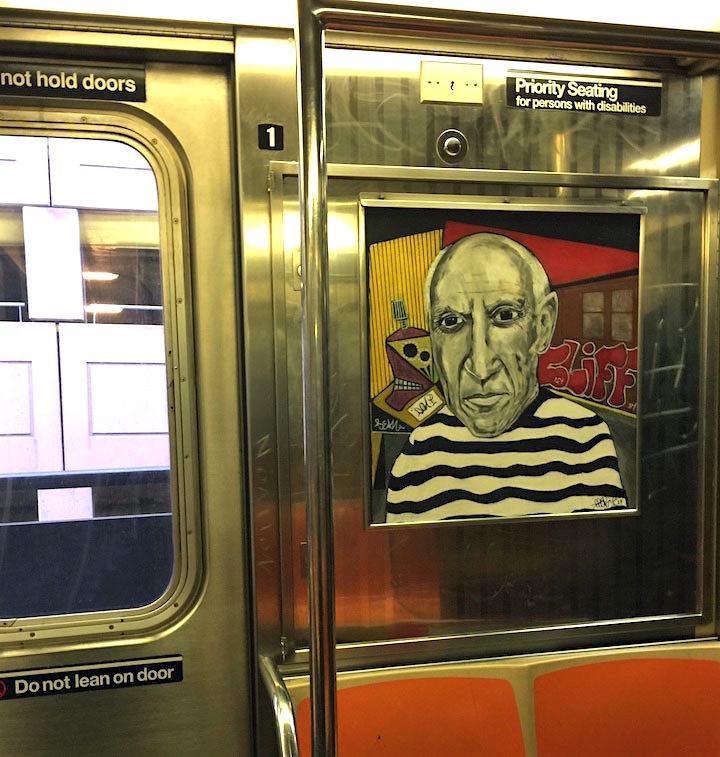 It was George’s idea that a few of us alumni offer the students a workshop in designing subway cars. 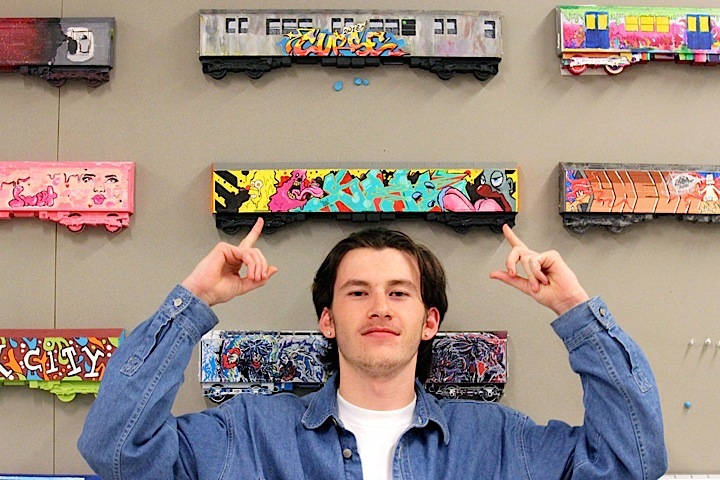 Alumnus Klim Kozinevich donated the All City Style Blank NYC Subway Cars and everything else followed. What was your original inspiration behind this? What spurred you to see it through? I felt that I wanted to give back. It was also an opportunity to educate folks about a global art form that has strong roots in this particular school. The panel discussion was certainly informative. George Alonso was the perfect moderator, and you, along with Spar One and Kenji Takabayashi, had much to offer. The audience was totally engaged. 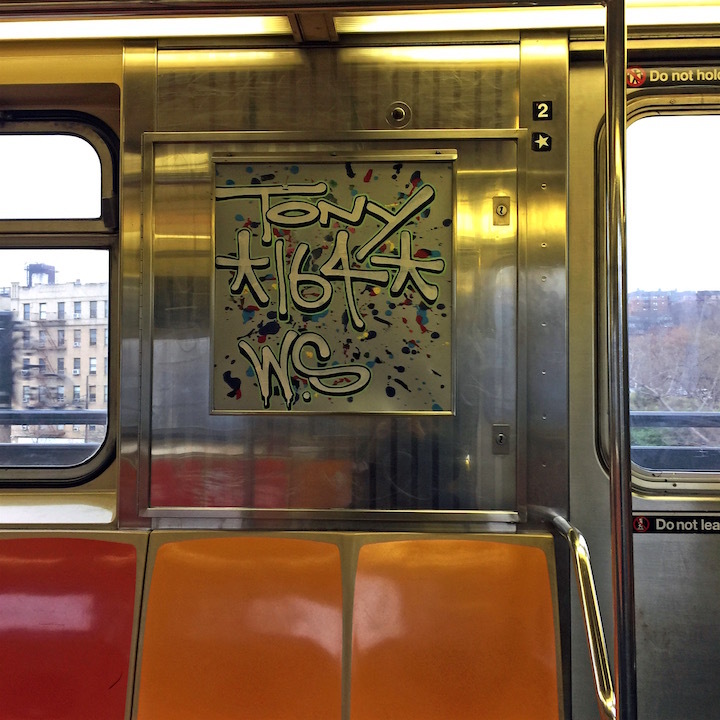 Why do you suppose there seems to be so much interest these days in graffiti, particularly from the perspective of veteran writers? 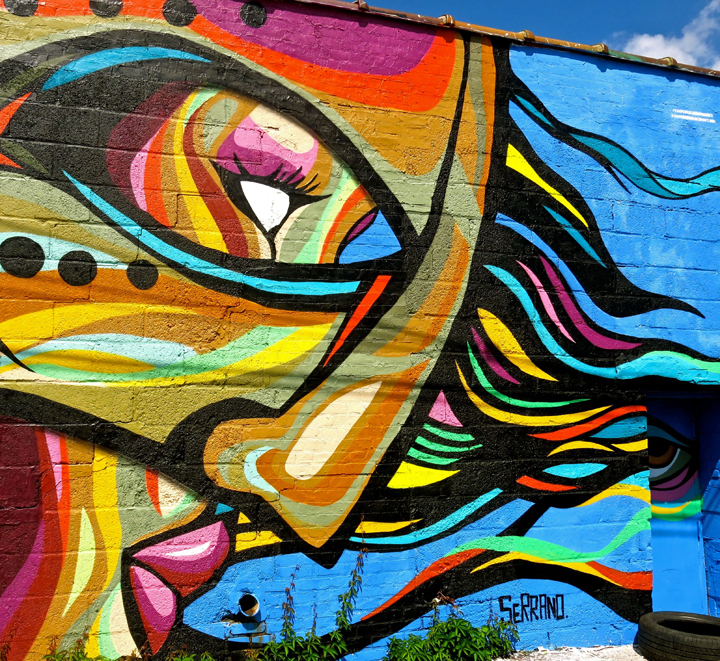 As graffiti is increasingly embraced by professionals and recognized as a legitimate art form, it is more likely to spur the interest of folks who would ordinarily dismiss it. Yes! Once an art form becomes the subject of museum retrospectives, it is difficult to relegate it to mere vandalism! What’s ahead for you? We are planning to continue collaborating with Art & Design. 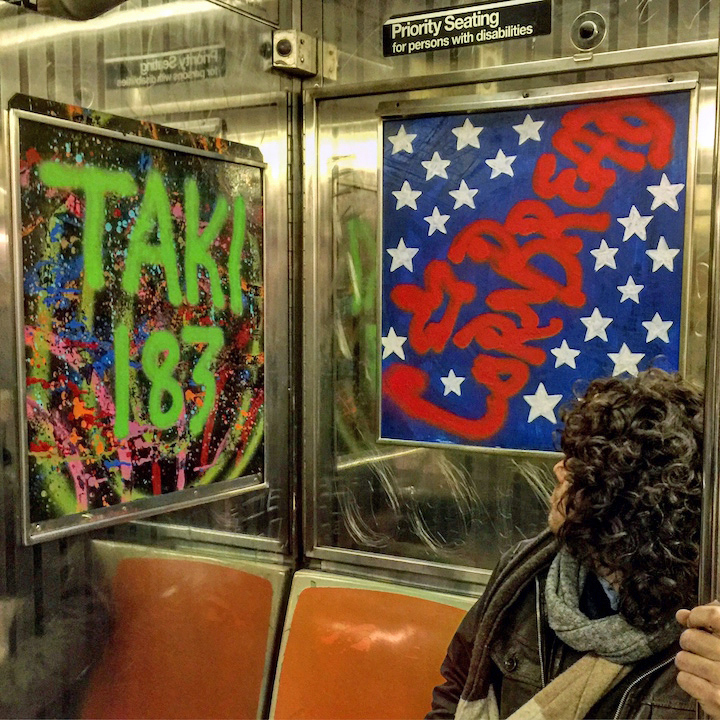 We would like to make the A&D Subway Car Design Competition an annual event, and we’d love to conduct graffiti–inspired design workshops in other educational settings. That would be great! Good luck!